The first American killed in Afghanistan after 9/11, at Qala-i-Jangi Fortress outside of Mazar-i-Sharif, where a monument stands in his honor. 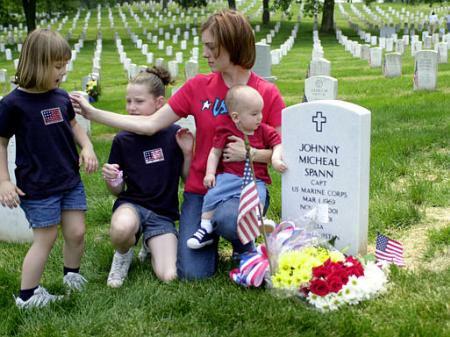 Every year on November 25 we remember Johnny Micheal (“Mike”) Spann, the first American killed in Afghanistan after the 9/11 attacks. It was on that date in 2001 that Spann was killed during a Taliban prisoner uprising at the Qala-i-Jangi fortress. The “American Taliban” John Walker Lindh was being held and interrogated at the fortress, though it remains unclear what if any direct role he played in Spann’s death. Hearing the news of Osama bin Laden’s death brought forward many emotions and memories. One of those memories for me was the story of Johnny “Mike” Spann, from Winfield, Alabama, the first American killed in … Afghanistan…, on November 25, 2001. Spann was a CIA operative, one of a small number of Americans who landed in Afghanistan, helped coordinate local forces hostile to the Taliban, and directed bombing and other military action. The story of this small band of men has been told, but not told enough. Spann was killed during the Battle of Qala-i-Jangi when Taliban prisoners gained access to weapons and attacked. Spann was killed during that uprising (see video). One of the prisoners was the so-called American Taliban, John Walker Lyndh, who Spann interrogated shortly before Spann’s death. Spann’s wife Shannon also worked for the CIA. In addition to his wife, Spann left behind two daughters and an infant son. Each year the research seems to discover new facts and stories, including the letter from Afghan warlord Abdul Rahdis Dostum and the memorial he dedicated in Spann’s memory, interviews with his oldest daughter Alison, and the family’s reaction to the release of Bowie Bergdahl and the possible release of Lindh. As we climbed out of the charnel pit where dozens of prisoners had been killed, I noticed something that seemed out of place in this grim setting, a marble obelisk monument about six feet high gleaming in the setting sun to my left. for Afghanistan, and for the United States. As the sun set over the lonely monument in the courtyard of the castle, I asked Dostum to tell me the story of Spann, the man slain in the fortress uprising who he would describe as both a “jasur” (a brave fighter) and his “dost” (friend). I quickly realized I was hearing the story about the very first American/Coalition soldier to die in what would later become known as the Global War on Terror…. From his home, his wife and his family, Spann was flown across the world to the republic to the north of Afghanistan, Uzbekistan. There he and the rest of his SAD team waited at an airbase known as “K2” (Karshi Khanabad) for news from Dostum, whom they were told was eagerly awaiting them in a mountain valley known as the Darya Suf 110 kilometers south of Mazar e Sharif. Then, some time around the night of October 12th, Spann and the other members of his team boarded a Black Hawk helicopter flown by the 160th SOAR (Special Operations Aviation Regiment) “Night Stalkers” and prepared to be infiltrated through Taliban airspace into Dostum’s rebel enclave. Half way through their flight their helicopter took part in the first in air refueling of the war, then proceeded on its long and dangerous journey. After over an hour and a half, the mountains of the Hindu Kush rose up before them in the darkness and they began to sluggishly wind their way up one dark valley after another avoiding the occasional Taliban anti-aircraft fire. Finally, they arrived at a HLZ (Helicopter Landing Zone) marked out by Dostum’s anti-Taliban Uzbek rebels’ lamps. As the fine Afghan dust swirled around them, Spann and the rest of his team scrambled out of their helicopter to be greeted by smiling Uzbek horsemen that looked like characters from a Star Wars movie. On the next day Dostum himself rode up with his guards and embraced them…. To assist Dostum in his plan, the CIA agents called in reinforcements including a Green Beret Team known as ODA 595 (Operational Detachment Alpha, code named “Tiger 02”) and a US Air Force combat air controller team to call in bomb strikes known as Operational Detachment Command 53. Together, the CIA agents and the Special Force teams began to ride with Dostum’s horsemen calling in bomb strikes before their cavalry charges. …. When it was over only a few of the prisoners survived (including one named John Walker Lindh, the so-called “American Taliban”) and Spann’s body, which had been booby trapped by the Taliban with grenades, was found with two 30 caliber bullet holes in the head amidst those he had killed in the final brutal seconds of his life. I also saw that the CIA Twitter account had a 2016 thread on Spann. Click through the whole thing. The Mike Spann Story is a movie listed as being in development, but I was unable to find out more about it. Put this in the “things I never knew before’ despite annual Google searches for new in formation. In 2002 the NFL endowed a scholarship in memory of Spann. NEW YORK, Feb. 11, 2002 – The National Football League has endowed funds for $10,000 annual scholarships in memory of CIA intelligence officer Johnny “Mike” Spann and Marine Sgt. Jeannette Winters, the first American man and woman killed in Afghanistan. League Commissioner Paul Tagliabue made the announcement Feb. 2, the day before Super Bowl XXXVI in New Orleans. Spann died Nov. 25, 2001, during a four-day Taliban prison uprising near Mazar-e Sharif. Winters and six other Marines died Jan. 9, 2002, in the crash of their KC-130R refueler aircraft in Pakistan. Spann graduated from Winfield High School in Winfield, Ala., and was a running back and wide receiver on the school football team. Winters was a track team member while at Calumet High School in Gary, Ind. Spann scholarships will benefit high school football players in Marion County, Ala. Winters scholarships will be awarded to female high school athletes in Gary, Ind. Judging criteria for both include demonstrated leadership and a commitment to community service, league officials said. Representing Spann at the ceremonial announcement was his football coach from Winfield High School, Joe Hubbert. Calumet principal Leroy Miller represented Winters. The scholarships were established by Tagliabue and Gene Upshaw, executive director of the NFL Player Association, and pay tribute to the character, courage and commitment Spann and Winters exhibited for America, NFL officials said. Spann is buried at Arlington National Cemetery. Michael Patterson at the Unofficial Arlington National Cemetery website kindly has given us permission to run his 2002 photo of Spann’s gravesite. Alison, currently a journalist with The Hill, posted this video of the gravesite. On February 27, 2018, Alison post this to Facebook regarding the movie 12 Strong, about American Special Forces put into Afghanistan to organize anti-Taliban forces. “As some of you know, my father was the first American killed in Afghanistan following the September 11th, 2001 attacks. He was a member of the CIA’s Alpha Team. They were the first team inside Afghanistan. That is why the movie #12strong is so offensive to my family. This movie falsely depicts the 12 man special forces team as the first inside Afghanistan and gives zero credit to the CIA officers who also risked their lives to achieve what the US did in Afghanistan. Below is an explanation from a fellow journalist who extensively covered Afghanistan and the men who fought there. My family is the “family” mentioned in the post and that is my step-mother, Shannon Spann, at my father’s grave in Arlington National Cemetery. What will be new for 2019? Possibly the release of Lindh from prison, a topic we covered last year. Heros like him are needed for the coming war within our borders. bradley manning should be re-charged. Im sure the military could come up with something left on the table. Hell, put meuller on it. Shabash Captain Spann. Let us never forget your sacrifice. I was going to say that Spann wasn’t just a Marine. But that’s the wrong way to put it as all Marines are special. So I suppose the right way to put it is that he was an extra-special Marine; he was an ANGLICO Marine. ANGLICO is the acronym for Air Naval Gunfire Liaison Company and these Marines are truly Special Forces. They’re the only forward controllers in the U.S. arsenal that can call in air support, ground-based, and Naval artillery support. I worked with them in a small way during my many short deployments in USS Belleau Wood when I was stationed in Japan. You’d never want to get on their wrong side but like all the SPECWAR guys I met they know they’re the real deal so they know they don’t have anything to prove so they’re pretty laid back. It’s the wannabes who want to give you trouble.